(Bangladesh) 1878 entire to Mauritius franked �a pair, 1a. and 2a. tied Calcutta duplex, overstriking two �Stamped� handstamps, endorsed at left �Via Bombay�/ �& aden�. 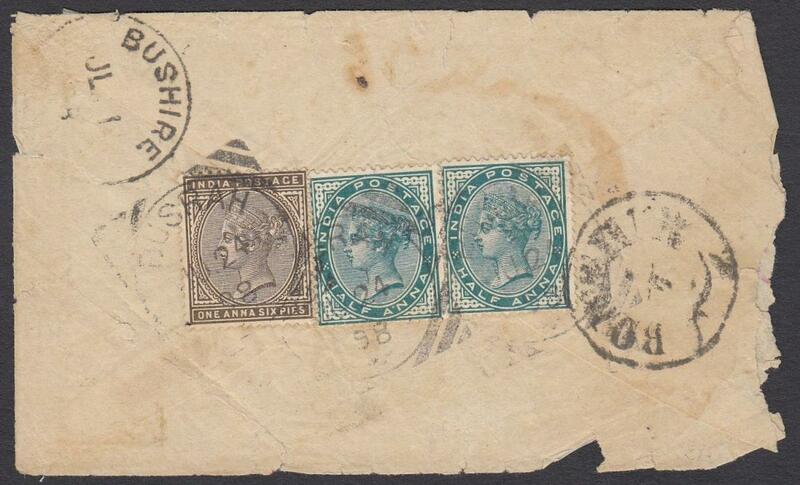 Senders handstamp bottom left as from Chittigong and letter so annotated, reverse with Sea Post Office B transit and blue arrival; good condition. 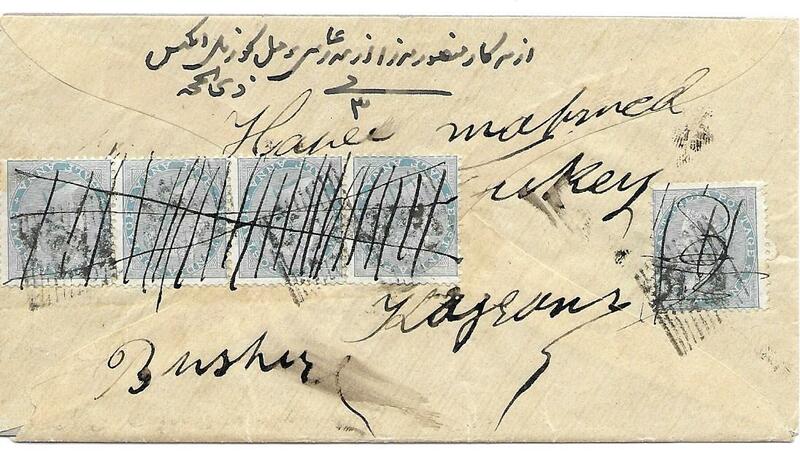 (Used Abroad) 1867 cover to Kazerun franked with five �a cancelled by �308� numerals of Bushire with extra pen markings. 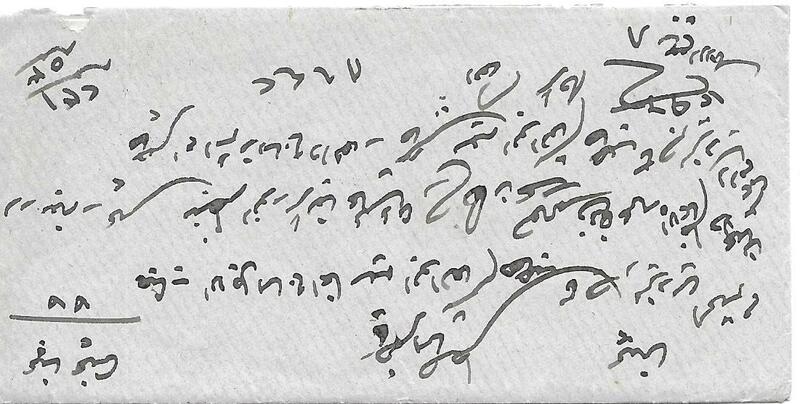 Kazerun is some 60 miles east of Bushire in Persia and evidently carried under local arrangements, since there was no Persian Posta Services at this time. 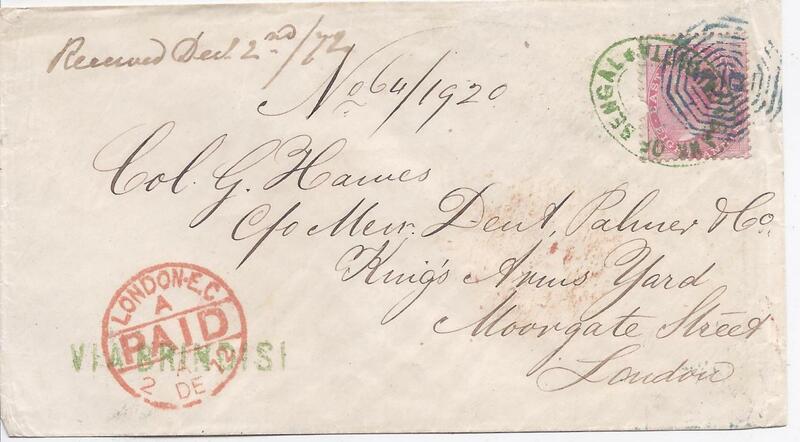 (Used Abroad) 1905 long registered cover to Holland,franked 2a. and pir 2 1/2a. 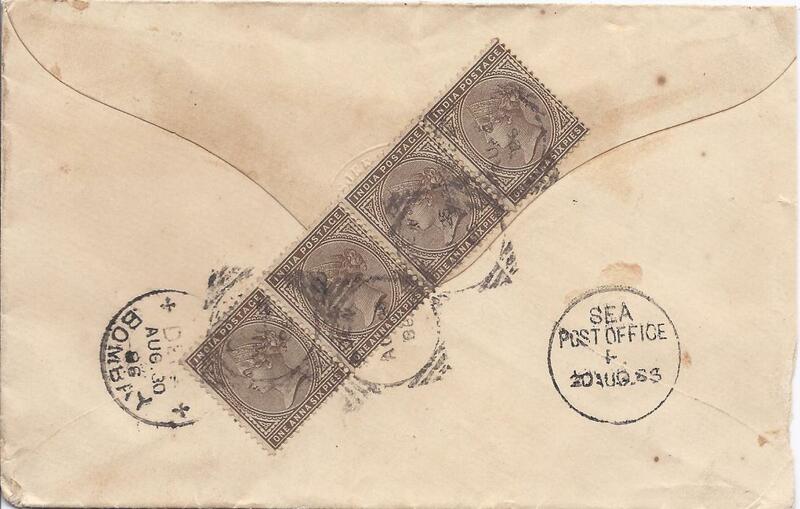 tied Bushire cds, framed registration at left, Sea Post Office C cds and arrival backstamp; central vertical filing crease. 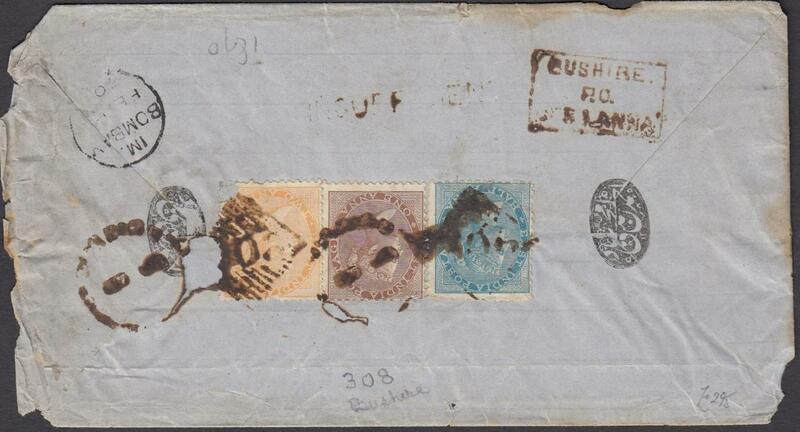 1860s cover to Bombay franked on reverse by �a, 1a and a damaged 2a, cancelled by '308' BUSHIRE duplex, slightly unclear "INSUFFICIENT" handstamp and framed "BUSHIRE/P.O./Reg 1 ANNA" handstamp alongside, with content letter; some faults to envelope. 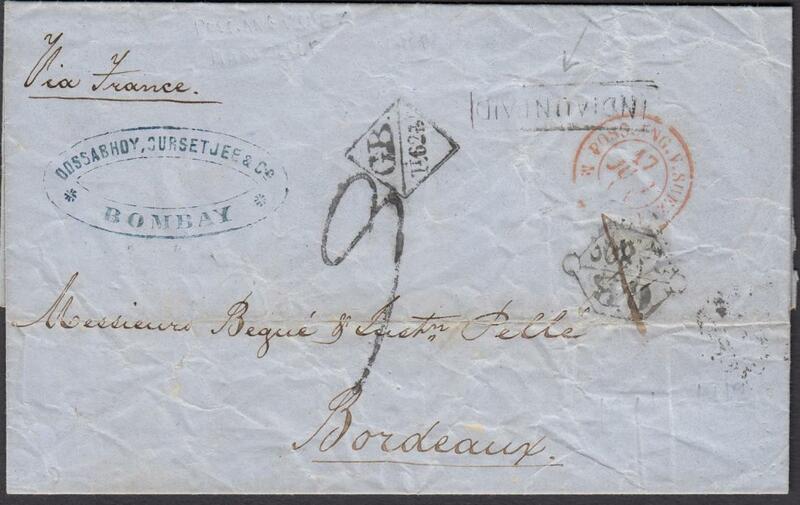 1863 entire from Bombay to Bordeaux bearing framed 'INDIA UNPAID' handstamp, accountancy handstamp 'GB/1f80c', which has been erased and a new handstamp 'GB/1f62c' applied, reverse with red despatch cds and arrival cancels. 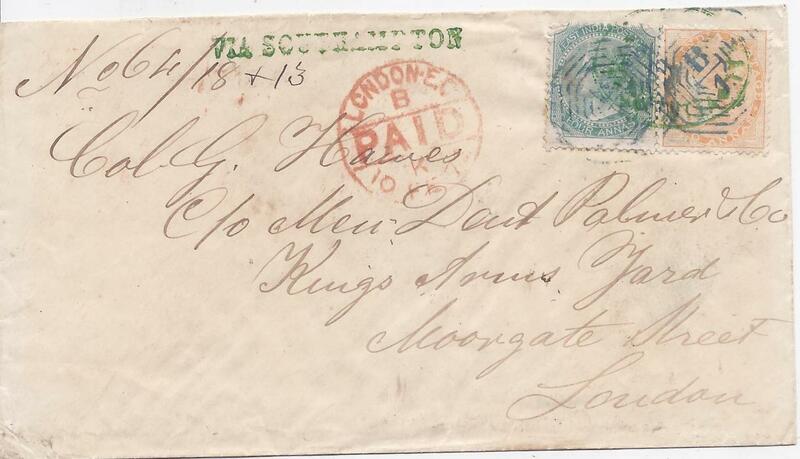 1867 cover to Scotland bearing single franking 6a.8p. tied �47� Peshawur duplex, reverse with red hexagonal Lahore transit and small Bombay transit, arrival cds; fine and clean condition. 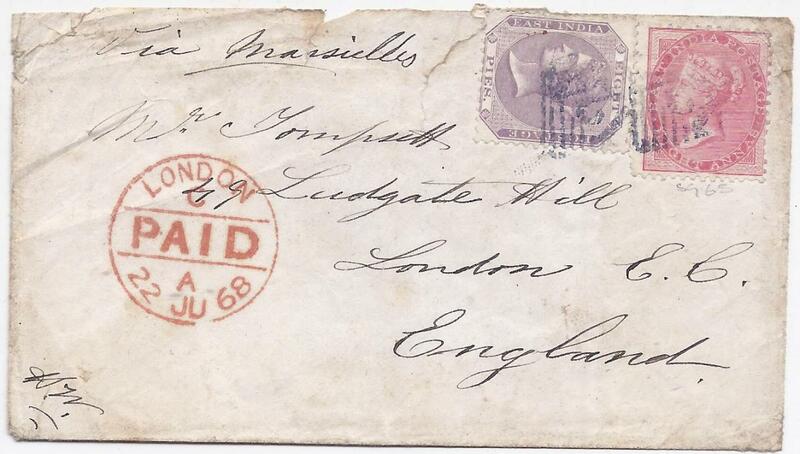 1868 cover to London franked India 8a. and 8p. 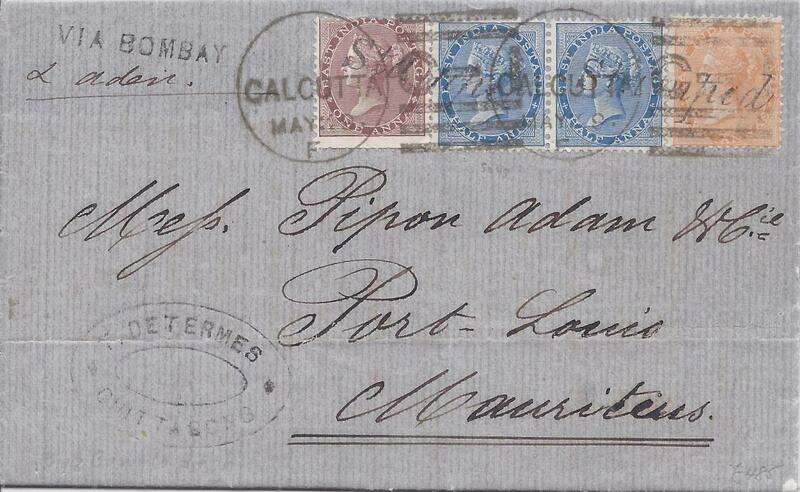 tied �24� numeral cancels, reverse with Aden Steamer Point cds and arrival on front; some slight faults, mostly to envelope, attractive cover. 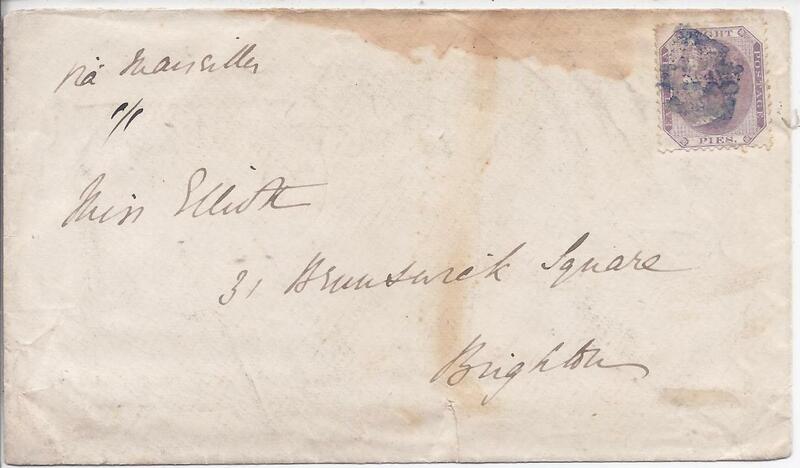 1869 cover to Brighton franked on front 8a. purple and on reverse block of eight 1a. 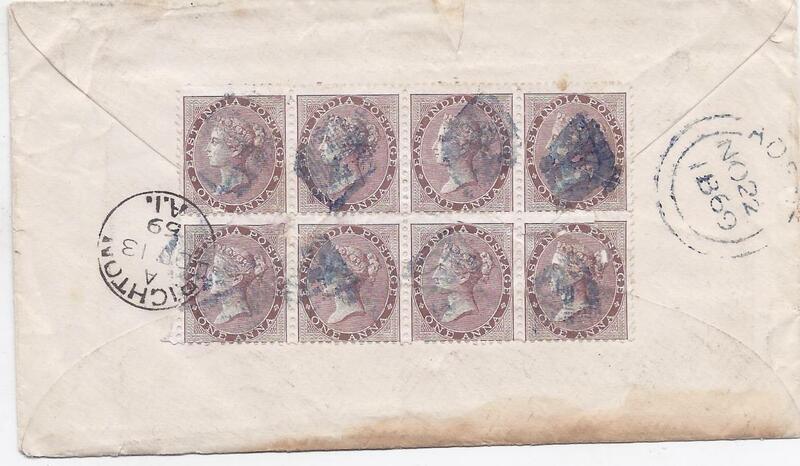 brown, all cancelled with blue �124� obliterators with cds on reverse to right of block, arrival at left; some staining to envelope affecting 8a on front. RPSL Cert (2011). 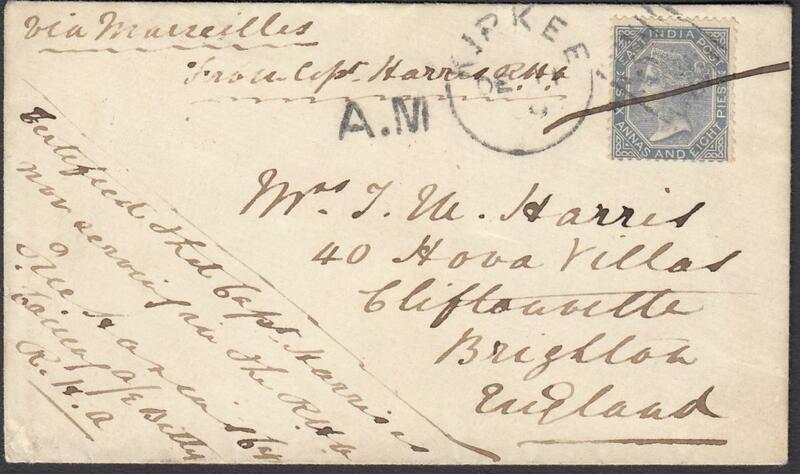 1870 cover from a Captain Harris to Brighton, appropriately endorsed, bearing single-franking 6a.8p tied 'KIPKEE' numeral duplex and pen stroke, black 'A.M.' 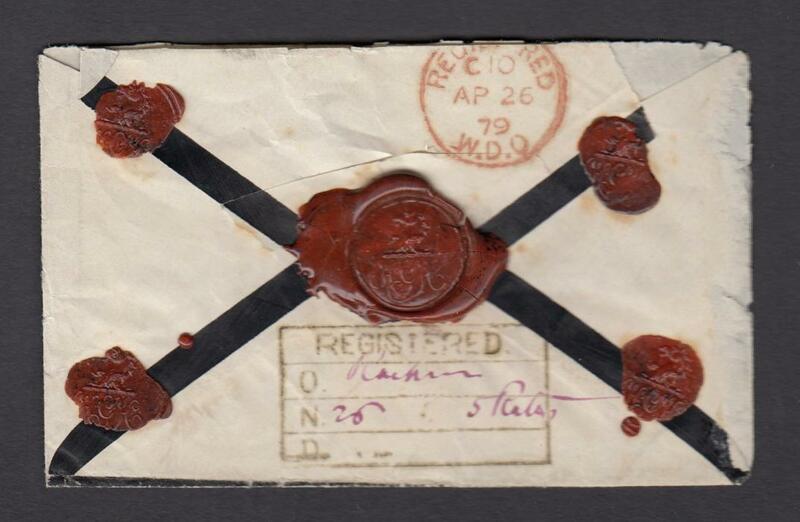 handstamp, reverse with red 'Bombay' transit and arrival cds; fine condition. 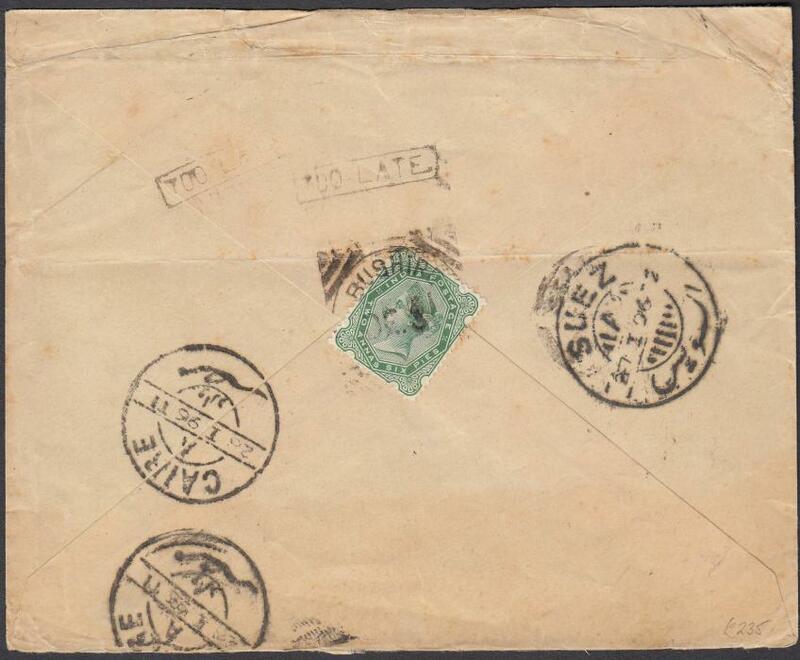 1879 cover to Cheltenham franked 6a tied barred handstamp and with manuscript initials, reverse with CANDHAR cds (Apr 18), SUKKUR transit (Apr 25), BOMBAY transit (2 May) and arrival cds. 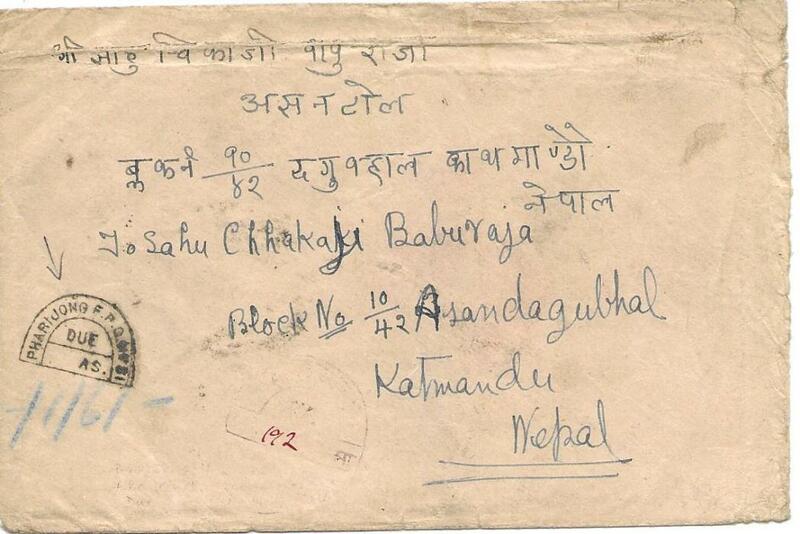 Envelope with imprint of Royal Horse Artillery. 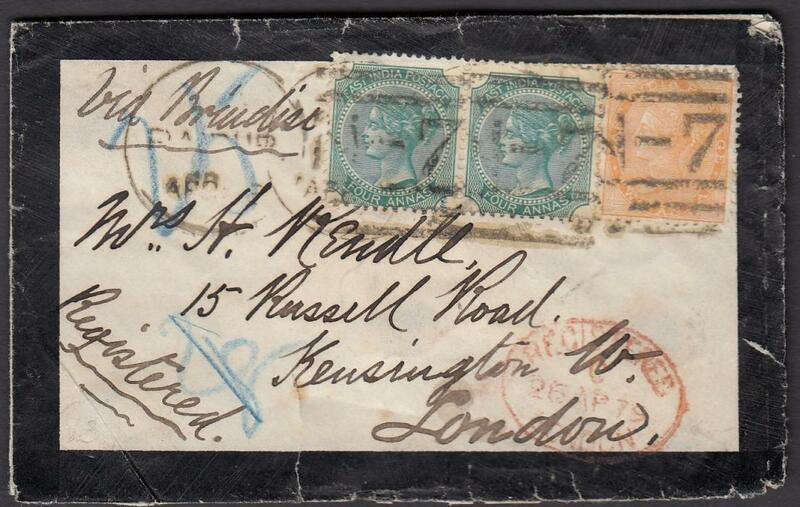 1879 mourning envelope to London franked 2a and pair 4a tied 'N-7' numeral duplexes, registration handstamp on reverse with manuscript details, arrival on front; some slight faults to envelope otherwise an attractive item. 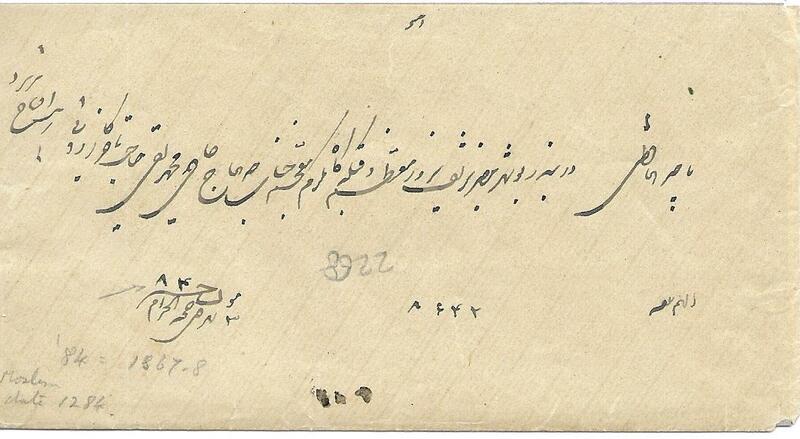 1880s cover to Shiraz, Iran franked on reverse �a (2) and 1a.6p tied square circle 'BUSRAH' date stamps, 'BUSHIRE' and 'BOUCHIR' transits of Indian and Persian Offices; some faults to envelope. 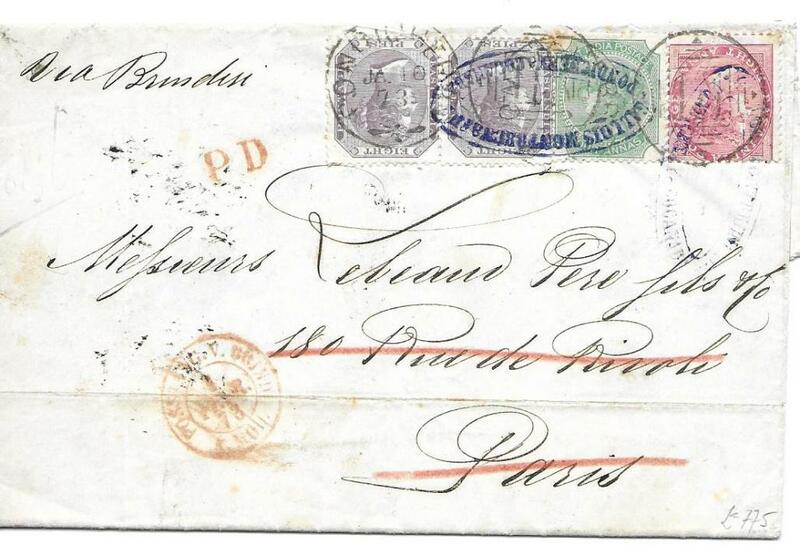 1886 cover to Bombay franked India 1a. and 8a. tied Aden barred duplex, envelope endorsed �pr Surat�, reverse with SEA POST OFFICE index D cds and Bombay arrival. 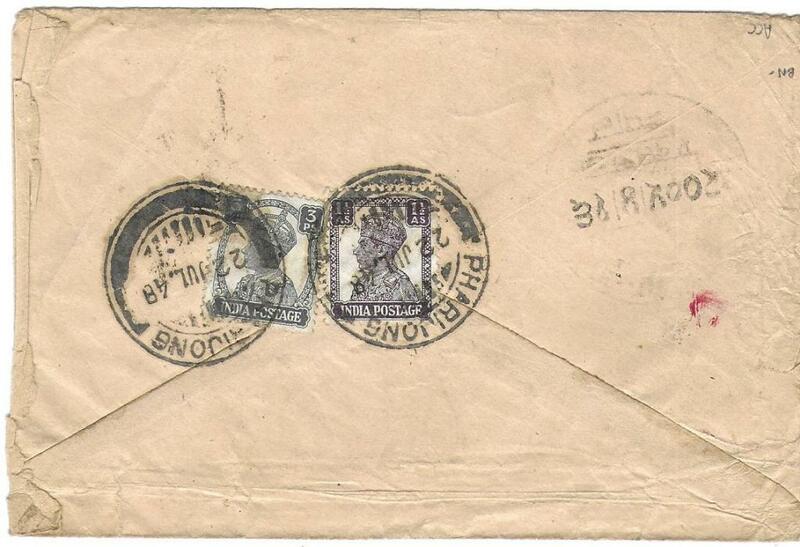 1889 cover to Bombay franked India 1a. (2), 2a. (2) and 3a. tied Aden barred duplex, envelope endorsed �pr Clyde�, reverse with SEA POST OFFICE cds and Bombay arrival.